WifiInfoView scans the wireless networks in your area and displays extensive information about them. This includes Network Name (SSID), MAC Address, PHY Type (802.11g or 802.11n), RSSI, Signal Quality, Frequency, Channel Number, Maximum Speed, Company Name, Router Model and Router Name (only for routers that provides this information) and more. When you select a wireless network in the upper pane of this tool, the lower pane displays the Wi-Fi information elements received from this device in hexadecimal format. A summary mode is also available that displays a summary of all detected wireless networks, grouped by channel number, company that manufactured the router, PHY type, or the maximum speed. How to extract: Download the ZIP package and extract to a folder of your choice. Launch WifiInfoView.exe. Fixed bug: When the SSID of the device updated, WifiInfoView displayed incorrect SSID string. Updated the internal MAC addresses file. Very happy: I just used this program to help track down the least-used channel in an area with a LOT of wireless connections and a lot of interference. This saved a lot of time, effort and energy (including electricity as multiple devices keep rebroadcasting their data). I was also impressed by the amount of data it pulled from the various WIFI services in the area. Great program. WinInfoView runs exclusively under Vista / Win7 / Win8, as noted in the System Requirements. ie. Who Is On My Wifi. 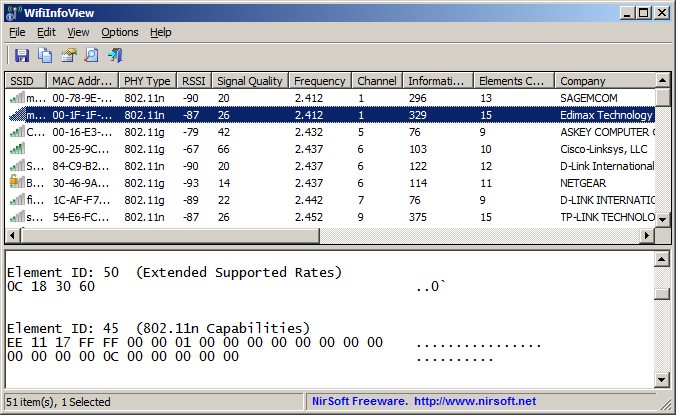 i use WNEtWatcher from Nirsoft..